If the apartment faces South, it will always be Sunny, and therefore warmer. This is noticeable even in the winter, not to mention the summer months, when the windowsill just glows in the sun. Few dare to grow in such conditions anything but accustomed to the harsh life of the succulents. Of course, some with curtains, and a complicated watering system is able to grow on the South side even delicate violets. But better to stay on the more hardy plants. In addition to these cacti, direct sunlight can make hibiscus, adenium, and passionflower. With a slight shading on the "South" also survive the figs, arrowroot, Myrtle, hamerops, Cissus, Coleus, Hoya. But they better keep on the windowsill, and put on the table by the window, separating glass lace curtains. If the room does not allow it, you can hang on the window blinds or to seal the bottom of the glass with tracing paper or gauze. Among other lovers of the sun can be called such plants as aloe, bokarneya, bouvardia, Jasmine Sambac, Japanese Camellia, Coleus, coffee, Laurel, mammilyariya, prickly pear, oleander, Sedum, livistona Chinese, plektrantus, REO, fuchsia, Haworthia, seriousy, Echinocactus, Yucca. But when breeding it is important to note that each type needs its own portion of the intensity of light. In addition, in our apartments do not live the original plants, and their hybrids, bred with reduced svetlovato. And that means that they behave not as counterparts in the wild. We must not forget that the South window is not the same. The same flower will be a different feel on the windowsill in Krasnodar or Iskitim. Another example: the South Windows on the first and last floor of the same house. At the bottom of the rays of light apartment protects the green trees, and above the sun beats down unhindered. 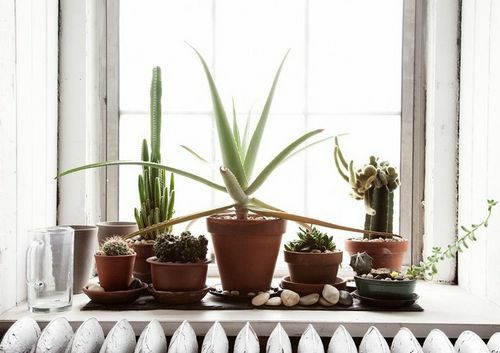 To put to a brightly lit window sill plants are not shriveled, and should be planted in the pots of bright ceramics or be placed in decorative light pots. Then the walls will reflect more heat, and the soil will be less warm. Experiment. Put a clay pot with the earth: one dark and glazed, the second light without additional coatings. Let them hold on to the windowsill for a few hours and then measure the temperature of the soil. The difference even a few degrees can be critical. Moreover, by heating the land faster evaporates the water and the flower will not be able to drink in the heat. When watering plants in the South window, be especially careful. Each trapped in the stems and leaves drop turns into a tiny lens. It refracts the sunlight and literally burn the flowers. Try to spend watering, as if it were a country garden early in the morning, chill, and in the evening, at sunset. In the midst of the heat of the watering can do more harm than good. And, of course, use only warm water. Inexperienced growers sometimes wish to cool the flowers in the heat and poured on the ground ice moisture. Alas, this is a sure path to the death of the mini-garden. The South window has one distinct advantage, which is so valued by gardeners. The abundance of light allows them to grow strong and healthy seedlings, even if we are talking about such a capricious species as eggplant and pepper. True, we have to invent different ways of cooling and hardening of seedlings, but it is not in the sky, in search of light.